Alexandria, Virginia's Birchmere has hosted musicians of just about every type and at every stage in their careers. Fans love the possibility of seeing someone who may go on to make it really, really big. Big names relish the opportunity to perform in a more intimate venue. 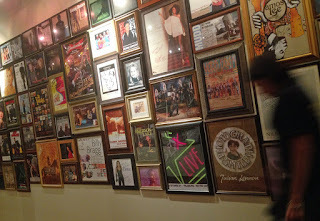 Every hallway is crammed with photos and posters of those who have visited the Birchmere. It's a Who's Who of Blues, Rock, Bluegrass, Country and Folk. Every time, I marvel at this intricate jigsaw puzzle, a survey of design styles in about 50 yards of wall space. My big question is this: who rearranges all of it when they decide to add new posters?